Included in this lot are. 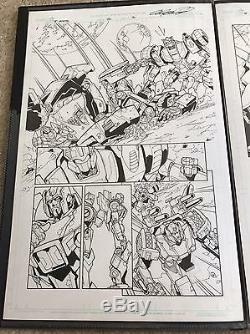 MTMTE Issues 2 pages 6, 16 & 17 (first appearance of SKIDS) inked and signed by fan favorite artist Alex Milne! 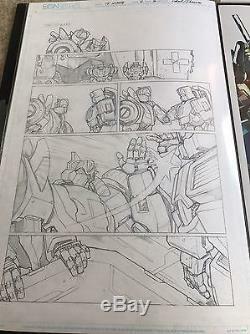 MTMTE Issue 12, Page 16 (First Aid, Chromedome, Tailgate) Pencil, signed by Brendan Cahill! 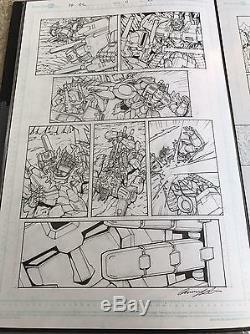 RID Issue 16, pg 14 Pencil (Megatron merging with Devastator) signed by artist Andrew Griffith! 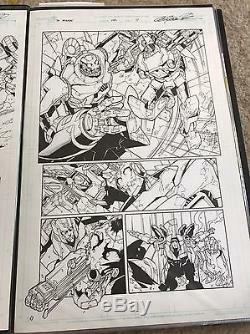 RID Issue 20, pg 14 Inked, Starscream and Scoop, signed by Griffith! 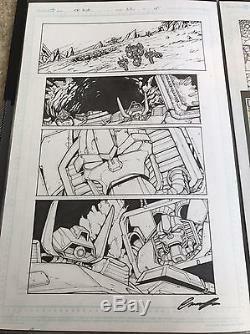 RID Issue 22, pg 14 Inked, Soundwave and his cassettes, Shockwave and Jihaxis, signed by Griffith! 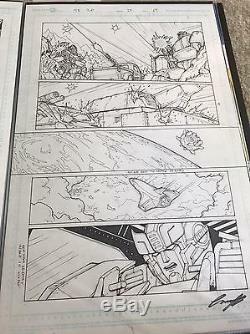 RID Issue 29, pg 14 Inked, Arcee, Kup, Sideswipe, Skylynx (Shuttle mode), Prowl, signed by Griffith! 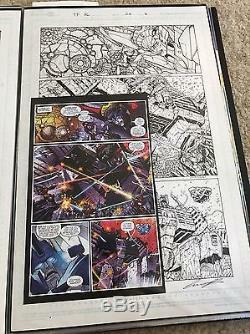 DC pg 8, Inked, Metroplex, Magnus, Windblade Signed by Griffith! DC Pg 11, Inked, Prowlvastator Signed by Griffith! 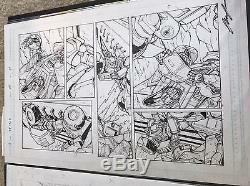 DC pg 16, Inked, Megatron, Bumblebee, Metal Hawk, signed by Griffith! 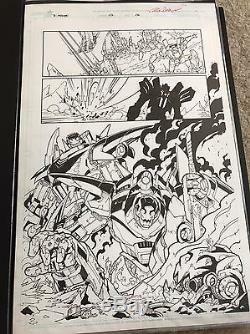 DC pg 20, Inked, Brainstorm, Bludgeon, Skids, signed by Griffith! 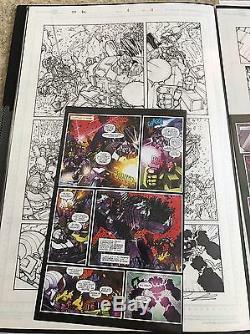 DC Pg 21, Inked, Brainstorm, Bludgeon, Magnus, Signed by Griffith! 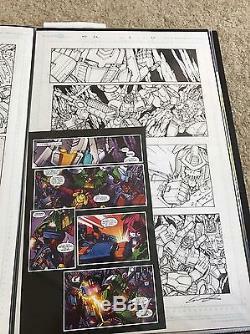 FREE PRINT, CYCLONUS and TAILGATE, signed by Artist Brendan Cahill. All pages are clean, crisp, kept safe in portfolio and come from a smoke free, no-child household. This is a GREAT opportunity for new buyers to start their collection off right! Don't pass it up! 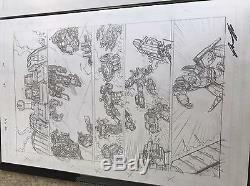 The item "IDW Transformers Original comic Book Page Art Lot! Milne, Griffith, Cahill" is in sale since Saturday, June 03, 2017. This item is in the category "Collectibles\Comics\Original Comic Art\Interior Pages". The seller is "anpthiew" and is located in Cedarburg, Wisconsin. This item can be shipped to United States, Canada, United Kingdom, Denmark, Romania, Slovakia, Bulgaria, Czech republic, Finland, Hungary, Latvia, Lithuania, Malta, Estonia, Australia, Greece, Portugal, Cyprus, Slovenia, Japan, China, Sweden, South Korea, Indonesia, Taiwan, South africa, Thailand, Belgium, France, Hong Kong, Ireland, Netherlands, Poland, Spain, Italy, Germany, Austria, Russian federation, Israel, Mexico, New Zealand, Singapore, Switzerland, Norway, Saudi arabia, Ukraine, United arab emirates, Qatar, Kuwait, Bahrain, Croatia, Malaysia, Brazil, Chile, Colombia, Costa rica, Panama, Trinidad and tobago, Guatemala, Honduras, Jamaica.